I have a clients application that I am having trouble with. I start it from Autoit code using Run. Autoit is just a scripting language if your not familiar with it. We have received a new version of the program from the client. They added a sign in form when the program starts. Now the program starts, the splash screen comes up as it always has, and then the new sign in form pops up. You sign in and then the main form opens. This new version runs fine from the desktop shortcut and even when started by navigating to the .EXE and double clicking it. But when I start it from AutoIt it starts, splash screen displays, and asks for the sign in like normal, but after entering username and password it gets an error. Not very informative. I tried to start it from the command prompt and I get the same error. I tried running the command prompt as administrator and get the same thing. On a PC with the old version, I have verified that I can start the old version from the command line with no issues. I have verified that I can start other programs from the command prompt since I saw a post here about not being able to start any programs from the command line. The program is installed by default to run in compatibility mode (XP SP 3). Any ideas why it would act different like this being started from the command line? EDIT: Just found a log. 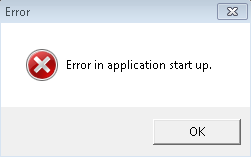 2015-12-15 08:20:07,847  ERROR log4com - Main ERROR: Error in application start up. Cannot create ActiveX component. 2015-12-15 08:20:25,520  ERROR log4com - Main Exception MSG: Cannot create ActiveX component. 2015-12-15 08:20:25,542  ERROR log4com - Main Exception SRC: Microsoft.VisualBasic. 2015-12-15 08:20:25,543  ERROR log4com - Main No inner exception. 2015-12-15 08:20:25,544  INFO  log4com - Time Tuning Releasing wfSystem object took up to 1 seconds. 2015-12-15 08:20:25,955  INFO  log4com - Time Tunning Realizing JMSAPI and Database objects took up to 1 seconds. Browse other questions tagged windows-7 command-line application-launch autoit or ask your own question. What is the difference between Symbolic Link and Shortcut?